Sorry guys but the pic I took on the phone today I can’t get from the phone to the computer…that is just wrong!! The sunrise this morning was incredible. A solid orange globe, bright and enticing. The haze diffused the brightness of the orange but added colors and glory of it’s own. God shows me something new everyday as I travel. I stopped to take a pic of the sunrise and as I sat there trying to figure out how I was going to capture this incredible beauty, a herd of deer jumped the fence not 25 feet from me. They tarried shortly along the bar ditch, listening to the running motor of my car. I sat still to watch nature at it’s finest. When they decided that I wasn’t a threat, they darted across the road, over the fence and off through the mesquite. You think I didn’t sit up and take notice of my life? Yes God, I am listening. I know that I haven’t always, I have pretty much ignored you. Thank you for showing me everyday that you are there and you are the one in command and that when I do listen to you that everything is gonna be okay. For many years I have tried to put it all in your hands, but listened to the people in my life and did my best to keep them happy instead of giving it to you and letting you make us all happy. Above being in school, I am in a place that I love with all my heart and get to see people that I am the same with. As I get to Ballinger every morning, I tell the valley hello again, I say good morning in my heart to a sleeping angel, and to the path ahead of me. I have completely enjoyed this past week!! It has been so refreshing and so stimulating that words don’t even begin to describe it! Put it in his hands and it WILL all work out!! Have a great day and a super weekend! Worries now are laid to bed. Okay, classes attended. They are all awesome! I have never taken a history class or government class with less than 100 people in it. I was shocked that there are so few in my government class. As much as I love history, government has always bored me to tears. I sat in class looking around wondering if you are sitting in the right place because it isn’t a lecture hall, this man walks in and opens his mouth and you immediately know that something is different. My POLS prof is from Scotland. His Doctorate is in Philosophy. He is funny, interesting and has a personality! Then I was really wondering if I was in the right class!!! So far I think that my favorite class is going to be newspaper writing. Imagine that!?!?! Me liking a writing class!!!! I drove home with my little brain just clicking!! I got nearly home, and I notice that the full moon is shining in the east. The sun is beginning to make its exit in the west and both are so beautiful! 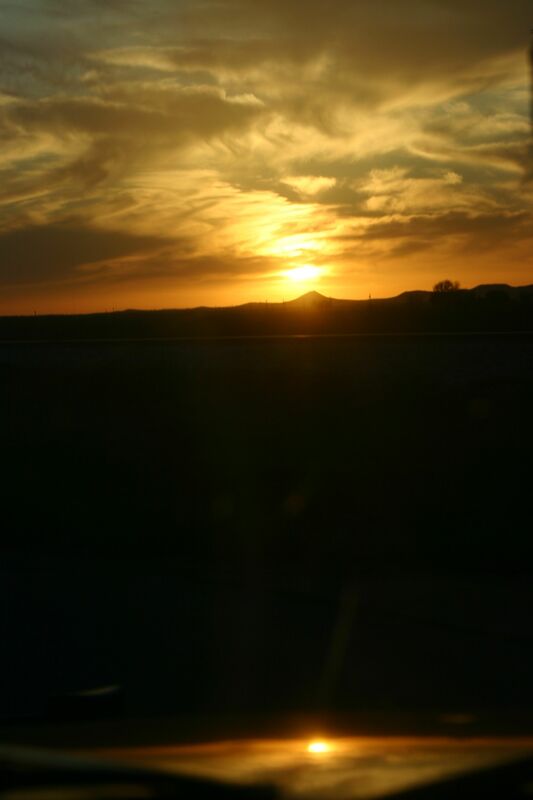 The sunset was miraculous!! The colors so vivid and the haze just intensified them!! Big rays through the few cloud that floated about. The moon getting brighter and bigger in the eastern sky. Was completely breathtaking!! I have a friend that has told me for years to get real with myself. Heath has been in my life since I was a little kid. He has watched me grow up, watched me make mistakes, try forever to correct those mistakes, and stood by me and encouraged me all along. He has told me for years to put people in my life that love me and support me. When I finally got around to taking that advice, God said yep, now is the time! Talk about being so very surprised that God would make life so awesome!! I have fought all of my life. I am used to things going incredibly wrong. This has really taken some getting used to!! I still doubt that I deserve all this, but I know in my heart that everyone deserves to be loved to be cared about and above all to be happy and love yourself. It was an incredible day!! I started this new chapter in life like I do everything else….jumped in feet first with a big splash!! I don’t know that it is special, I don’t what I am doing as anything spectacular. I have always been taught that you do what you have to do, you set your sights and fight like a bulldog to get there. Daddy decided at 67 to start a new business…going back at 40 ain’t got nothing on that!! Have a blessed day filled with love and many many smiles!!! Doin a happy dance!! Doin a happy dance! I start class tomorrow!! I can’t help it!! The house is ready, the car is ready, my books are ready, gonna make a brisket today for tomorrow, pimento cheese in the fridge, camera ready…always, now just got to figure out do I wear my new t-shirt and jeans or do I wear something nicer?? It is like I am a little kid on the first day of kindergarten!!! doin a happy dance! doin a happy dance!! Yesterday was move in day at ASU. In a way I was envious, in a way I would love to be moving into an apartment or house in Angelo. I had a someone special tell me not to wish away the weekend. I don’t wish anything away. I don’t wish the weekend away, I don’t wish away the lives I am entrusted with. I do wish that things were different. I do wish that I could move. But things aren’t different, they are what they are and that is life. It doesn’t stop me from knowing that some day in the future that they will be where they are supposed to be. I just take all the good and rejoice in it! I take the good and run with it. The rest of it…I deal with. I will always do what I am supposed to be doing but that doesn’t make me not want it all right now sometimes. I can’t help that but what I can do is work on me, work on the goal, and work on the obstacles. Enjoy the moments that make me smile and accept those that break my heart. I am so excited about Monday!! I step out into the real world again, a world of learning, of people, of singularity. I am so ready!! I thank all those people that have encouraged, empowered, and stuck by me through all of the changes. You will always be in my heart and always be in my life. 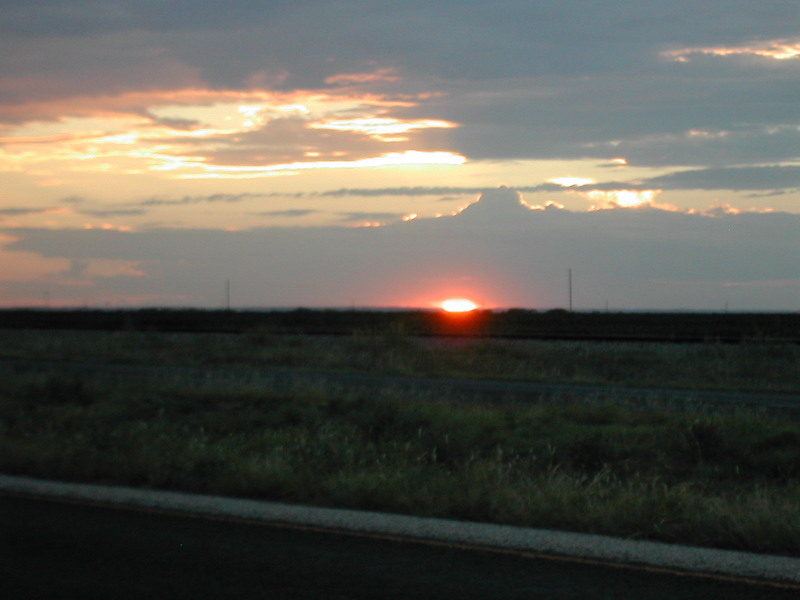 I do love a West Texas sunset especially on days when the smell of rain engulfs me and I have had a great day! It never seems to fail that when I am leaving San Angelo after a great day that Mother Nature has to put in her two cents. I was driving with the window down and the radio playing Uncle Kracker as I looked back over my shoulder to find this sunset. It draws me back everytime! Today is Friday, I start class on Monday. I hate to wish any day away but I sure wish it was Monday!! I made myself a promise on New Years, not a resolution but a real promise, that I would go back and finish my degree. That this was gonna be a great year and that everything was going to go right! Spending the day in San Angelo on Tuesday, I knew in my heart that it was going to be perfect. I don’t mean perfect in the ideal way, I mean that even though there will be ups and downs, some detours, and a few bumps that it will be just fine. I never get my hair cut and come out of the beauty shop feeling good. I did Tuesday. I hate getting my eyes checked, not Tuesday. Going to Sam’s Club is generally a chore even if I take a friend. Not Tuesday, it was quite pleasant. When so many things go right how can you question where you are and what you are doing? I still look for the other foot to fall….we are sorry, but you really didn’t get accepted into this institution, sike your financial aid didn’t really go through, oh by the way you can’t take that class…I know that none of these things are going to happen but you still wonder. It has been nearly a year and I am just now coming to terms with the fact that I am ready to move on. To show the world what and who I am. I have done my duty, I have done my chores, and I have taken that first step. Now comes the real jumping off place. There are so many reasons that I am excited about this. Everyone sees the main reason, but some of the other reasons are just as big. Just way more personal. I have learned that in life you cannot take a step in the right direction in just one area of life. When you make that decision to go that direction, your whole life goes too. Be it as it may, it happens that way. It is like I cannot take the step to start school without getting rid of a lot of baggage, a lot of fears and self doubt. I cannot take this step without making changes across the board. A year ago seems like a lifetime. Have you ever wondered what my fascination is with that blue eyed tiger? First of all I love all tigers and big cats, they are amazing creatures. But the blue eyed tiger reminds me to look in the mirror once in awhile. I used to look in the mirror and see the person that I wanted to be stuck behind those blue eyes. The fight seemed to have left sometime in the last twenty years. Three years ago I looked in that same mirror, seeing that same reflection, and decided that I am a Tiger. There is fight in my heart. So, at a massive 358 pounds I hit the pavement, I gave up sodas, I went to work. I found that fight again. Am I finished with me? No and I never will be for there is always room for improvement. So Monday morning, a little on shaky ground, I take off down a new and exciting path! A path that leads to a new life, new friends, and a renewed passion for life. God has shown me so far that this is where I need to be walking, he has put people in my life to make it happen, to support and nurture, and to show me that I am loved no matter what. Life is an adventure again, look to the horizons both east and west for it takes the sunrise to start you off and the sunset to put you to bed. Everything in between is what you make it! 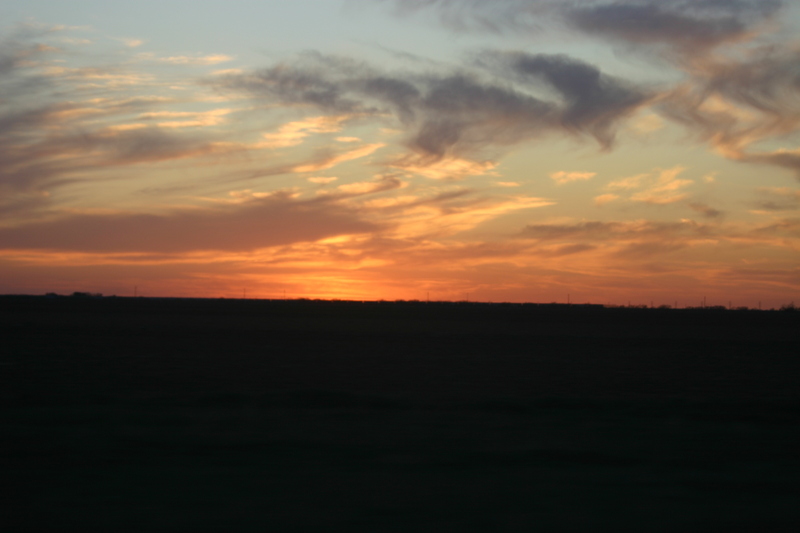 West Texas! There are some places that just live inside of your heart. This is one of the places that lives in mine. How lucky can a girl get? To finish my education and spend three days a week some place that makes your heart race? Bring it on!! Do I still have worries and concerns? You bet I do. Knowing in my heart that I am doing the right thing doesn’t keep me from feeling like I am shirking one set of responsibilities for another. I just keep telling myself….Priorities! Would it be easier if I had help? Well yes it would. But since I don’t have the support of some people that I should have, and don’t foresee it ever happening I will do what I have to do to get through it. I always have and I always will. I get up in the mornings and I give it to God and he will take care of it. It used to make me really angry that I didn’t have the help and support I needed but I am way past that in life. I look at it this way, I am the one that has all the rewards of what I do. I have the greatest memories, I have the greatest relationship with Daddy, I have his support, his respect, and his love. Why do I have these things? Because I give him the same. These things are earned even by a child. I think that with the support of my friends and Kristen and Trey that everything is going to be okay. I give it to Him and pray for the best ‘sall I can do. This is going to be a busy week and the first week of class will be one of getting into the swing of things. I hope that I can at least keep up with my friends during all of this and keep up with my blog. Life has its twists and turns and dreams that come and go. Time will tell where I end up and how all the cards will fall. That first step…I am still so ready!! Have a great day. The path is winding, crooked, and bumpy but that is what makes the adventure all worth taking! This morning I got up and looked at the world and everything that I think I have to get done. Ever since Mom died I seem to have taken it upon myself that everything on this place is my responsibility. I have worked hard and tried my best but being the perfectionist that I am it never seems good enough. Everyday there is something that “has” to be done. I live less than 20 minutes from the lake, I haven’t been there in over 3 years. The few days that I take for me I always seem to have an excuse to take them or a reason to leave the house. This morning I said enough!! It is Saturday and I want to do something other than clean, cook, or mow the yard. OMG! I went back to bed and stayed in my pjs until 3pm. I have played on the computer, watched a movie, drank coffee, and just been a bum. And guess what? The world is still turning, the house didn’t catch fire, and everyone is still alive, fed and watered! The process has been a long one and trying to get back to some normal type of life that isn’t killing me mentally or physically has been long. Okay I may need to be reminded on occasion that it is a good thing to just mess off a day now and then. That is why I have such wonderful friends in my life. It has been a great day and I feel really refreshed. I can start the new week with a better attitude and a new outlook. I think this is another step in the direction that I am heading, boy when I get there I am going to be a different person. I don’t know why I have always thought I had to be the responsible one. Maybe part of it has to do with the fact that my older siblings always were the carefree ones. That I was the one that hung around and took care of everything. When I had Kristen I was adamant about the fact that as a single mother she was my responsibility. Then when I got married I added a husband, mother in law, and sister in law to my responsibilities. I was the caregiver. Not that I wanted to be, but because that is what seemed to be expected. I seem to have had a lot of things expected of me. I was miserable. Now that I can be honest with myself, I can be honest with everyone else too. I relinquish many of these expectations! I will do the things that I deem necessary. Like to take care of my dad. My choice. To finish my education. My choice. To live my life and find someone that I love. My choice. For once in my life I don’t see this as being selfish, I see this as being honest, upfront, and actually living! It is about a week until classes start. I am so excited that I can’t hardly see straight. New friends, new experiences, new faces and new knowledge! Life is turning around and so am I. Somewhere in the recesses of my mind I knew that I would get to this point in life. Just didn’t know what all I would have to work through to get there. Anything worth having is a lot of work. I have no regrets, just memories good and bad but all worth it. Light dawns and the world shines bright. Have an awesome day!! I find it funny that when you work yourself into a state, take a nap and leave the world outside that is when God shows you the most wonderful things to make it all better!